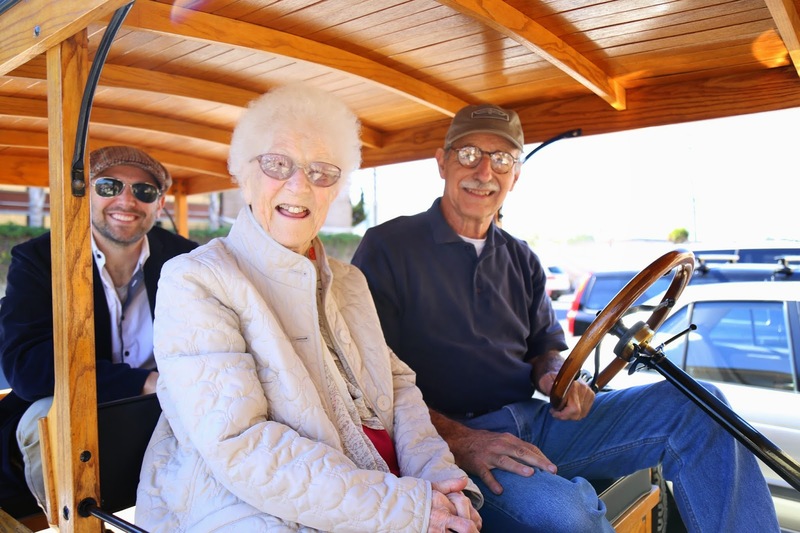 Edythe Kirchmaier recently turned 107 years old and, while discussing her car ownership history – dominated by Fords – with me, it came to light that her driving experience began in and with the first mass-produced car: the Model T. She learned to drive on one and had fond memories of it. It was thus ideal when the oppor- tunity presented itself to arrange for Edythe to reunite with that car by con- tacting Roy Miller, owner of a 1915 Ford Model T. Upon hearing about 107-year-old Edythe and my desire to put her together with his vehicle, Roy graciously offered to give Edythe a ride. 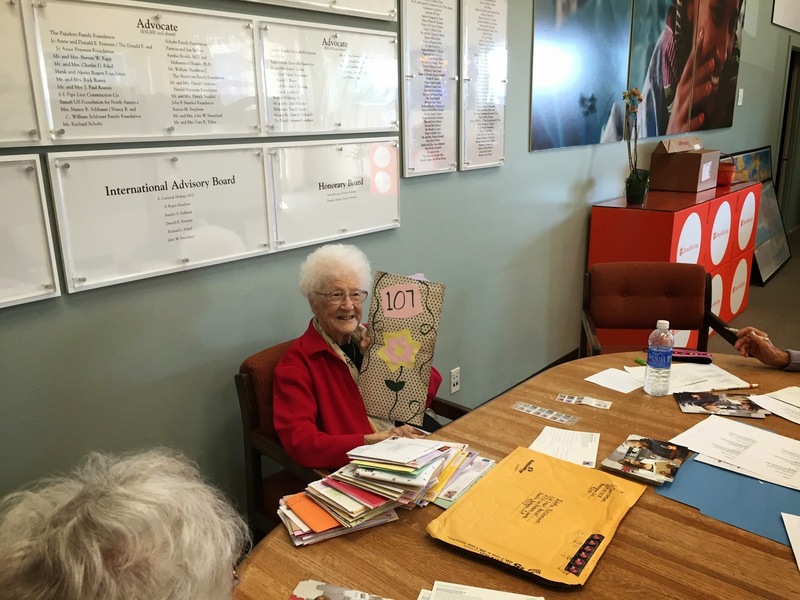 We arranged to surprise her at the Direct Relief offices during her usual Tuesday visit, with a big assist from Hannah Rael, who handles the charity’s media relations. At first, I presented Ms. Kirchmaier with a tiny replica of the Model T that I’d recently assembled, which positively lit her up. 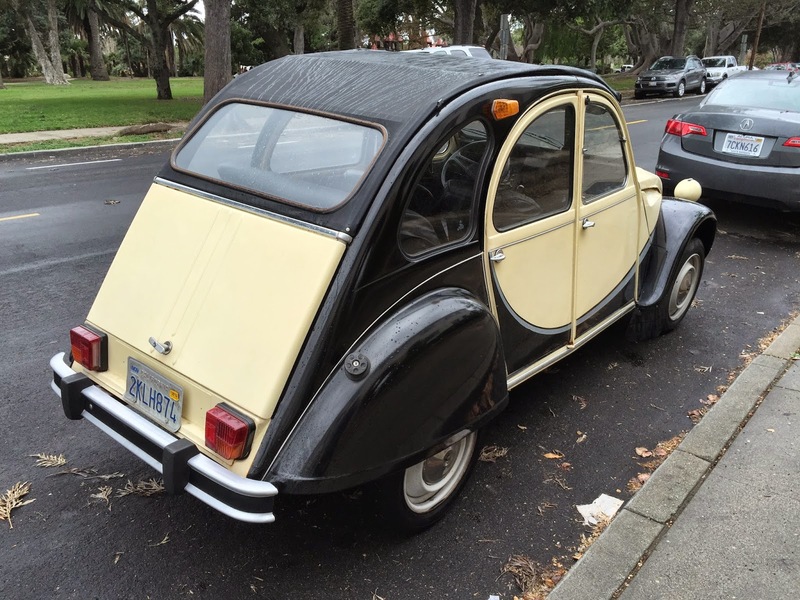 She then described her uncle’s car, a hardtop with curtains around the cabin she had learned on. The ultimate thrill, though, was her joy when we brought her out to her personal parking spot to see the real deal pulling up. The entire Direct Relief staff emerged from the office to see us help Edythe get into the car. Roy was thrilled, as this was his first opportunity to pilot the car with a passenger who was alive when it was constructed. 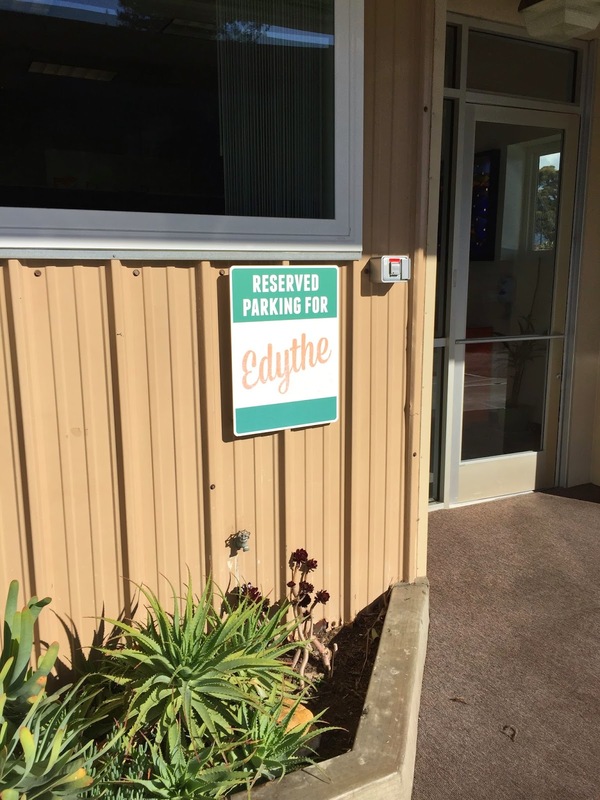 The two of them talked about what it was like to drive during that era – Edythe revealed that she didn’t even need a license. The Model T is not an easy vehicle to start. When it was time to set up, Roy hopped down to hand-crank the motor with a lever sprouting from the radiator grille, careful to adjust the spark timing in order to avoid the signature kickback that leads to tales of broken wrists. We putt-putted out of the lot and down the lane, never reaching the T’s top speed of 45 mph, but Edythe was giddy the whole time, reflecting on cascading memories as we trundled along. After Edythe exited the car, Roy offered to hand me the wheel. But first, he said, an in-depth lesson would be required; piloting a Model T is a different endeavor from driving a modern car. 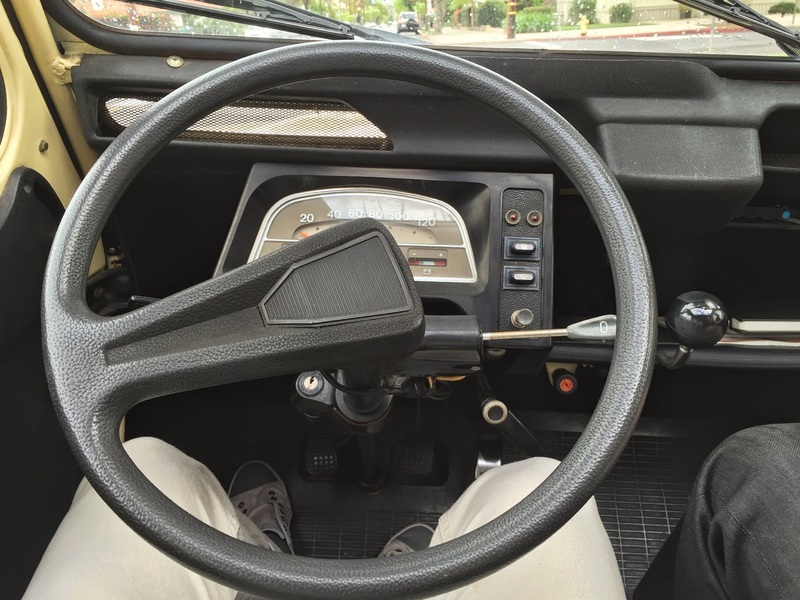 Yes, there’s a steering wheel, a handbrake, and three pedals arrayed on the floor at your feet. But this control setup is deceptive, since those pedals bear little relation to those of a present-day stick-shift. That one on the right? That’s the brake. And where the brake should be, in the middle? Well that’s actually reverse gear. A clutch pedal on the left? No way; that’s the gear selector. So where the heck is the throttle? That’s actually the little lever mount- ed right behind the steering wheel. It points to 2 o’clock at idle and swings down to bring the revs up. There’s another lever on the left side of the wheel that controls the spark timing. I eased down the throttle lever and leaned on the center pedal with my left foot, easing off the brake with my right, and the T puttered gently back- ward out of the spot. Next, I cranked the wheel the other way – clockwise does actually turn the car to the right! – and gently toed the left-most pedal to get the car into low gear. Keeping the car in that gear requires you to have your foot planted, but once we got to a more open space I was able to ease off, the pedal backing through neutral and into high gear. At this point, I got to experience the T’s full-bore acceleration, all 20 horsepower worth, which would have been plenty for an era when there was no such thing as a highway on-ramp. We made our way back into the parking lot after a few laps, and I managed to ease it back into the space without much drama. In fact, the drive was surprisingly anxiety-free, and I took to the task more quickly than expected. I’ll give most of the credit to my esteemed instructor, Roy, who arrived in Santa Barbara three decades ago, having spent time in Germany during his Army days, and Los Angeles and Las Vegas on many interesting ven- tures, including as a successful SCCA racing career. Lured here by a friend who owned a Lotus workshop, Roy bought his own auto shop in Santa Barbara shortly thereafter. 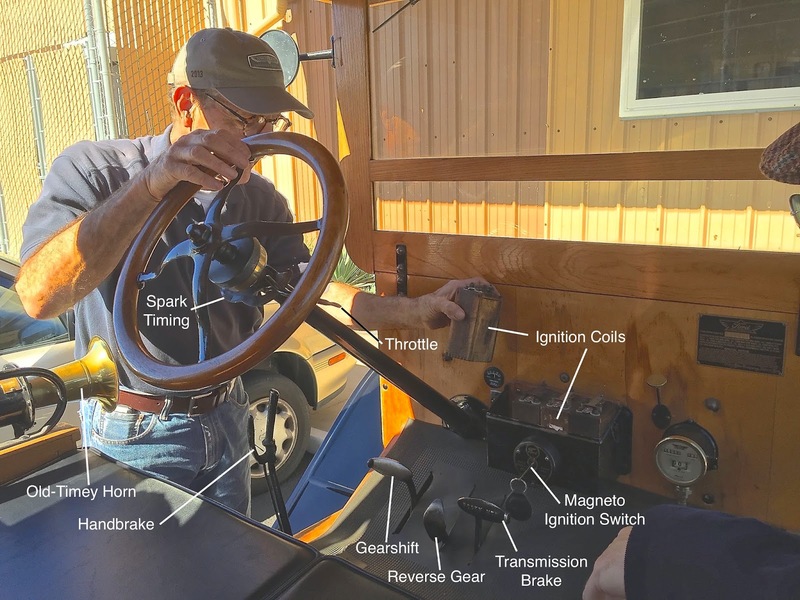 He bought the Model T some 15 years ago, and because the car wasn’t running at the time, so he got a great deal on it; he says it only took around 20 minutes of work for him to get it to crank. Restoring the vehicle was a labor of love that took several years to complete, particularly with Roy’s appreciation of the significance of the task. More than most old cars, preserving a Model T is akin to translating a manuscript of history. It helped, too, that he’d been working on pre-war cars for more than a decade at his shop, East-West Motors. Aside from plenty of local events, perhaps Roy’s most high-profile gig is as a judge for the Pebble Beach Concours d’Elegance. With this association comes a network of some of the most knowledgeable car experts in the world. And he certainly tapped this network to help guide him in his restoration of the antique Ford. The Model T isn’t just a car; it is a symbol of America’s industrial might, which helped to launch our nation’s trajectory as the most powerful force of the 20th century. While car people get riled up about a classic Corvette, everyone goes gaga over a Model T.
And it was for this reason that it was such a privilege to experience the car with the incomparable Edythe Kirchmaier. As humans, we’ve grown to treasure the links to our past, tracing the path of our evolution. 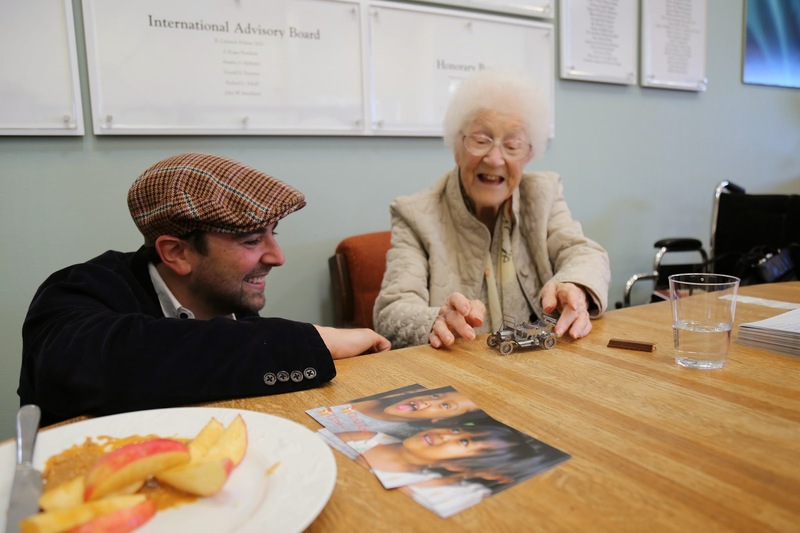 It’s a thrill to be able to ask a woman like Edythe, “What was it like?” And it’s even more of a thrill to relive it with her. Santa Barbara Cars and Coffee just flipped the script. At the beginning of the year, the weekly event’s main gathering spot moved to the Upper Village, with the Coast Village Road location now serving as the special last-Sunday-of-the-month location. The organizers say the upper village site can more easily accommo- date a larger crowd and large vehicles. Herman Pfauter is happy with the change. He has been showing up at Cars and Coffee on and off for years, often with some of the biggest vehicles around. On a recent Sunday, Pfauter showed up with his three-quarter-ton Dodge weapons carrier. No, Pfauter doesn’t carry around an arsenal fit for an army, but his Dodge did when it was built in 1944 for duty in Europe. In fact, Pfauter has enough vehicles for a small army motor pool. Just a few weeks before, he brought to the upper village one of his four original Army jeeps. And those vehicles, built by Willys-Overland and Ford, are where his passion for American military iron began. 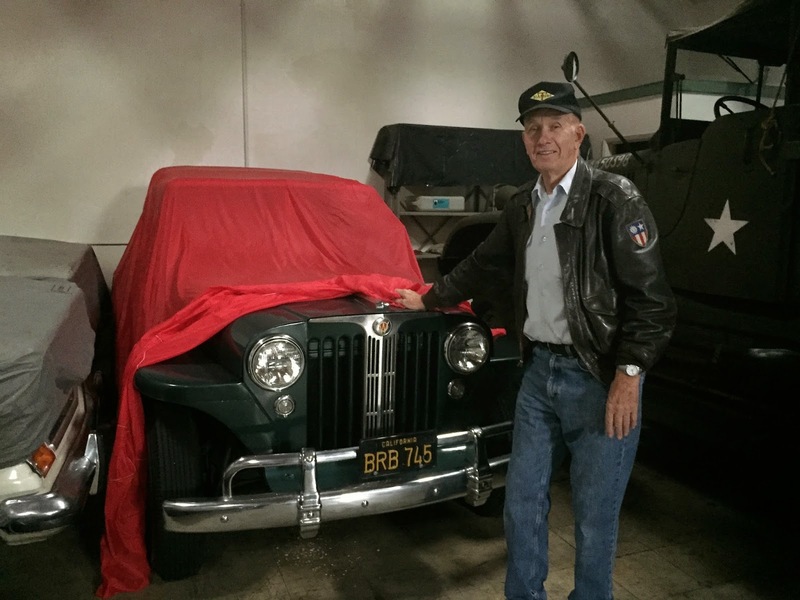 While his first car was a ’48 Chevrolet that he bought from a GI in Germany, he soon indulged his fantasy and bought his first Jeep in 1953, as soon as he’d secured a driver’s license. And by the end of the decade, he was on his way to the country that made those vehicles, drawn by a job offer as an auto mechanic near Boston. There he worked on Jaguars and Renaults, despite his training at the Mercedes-Benz factory. 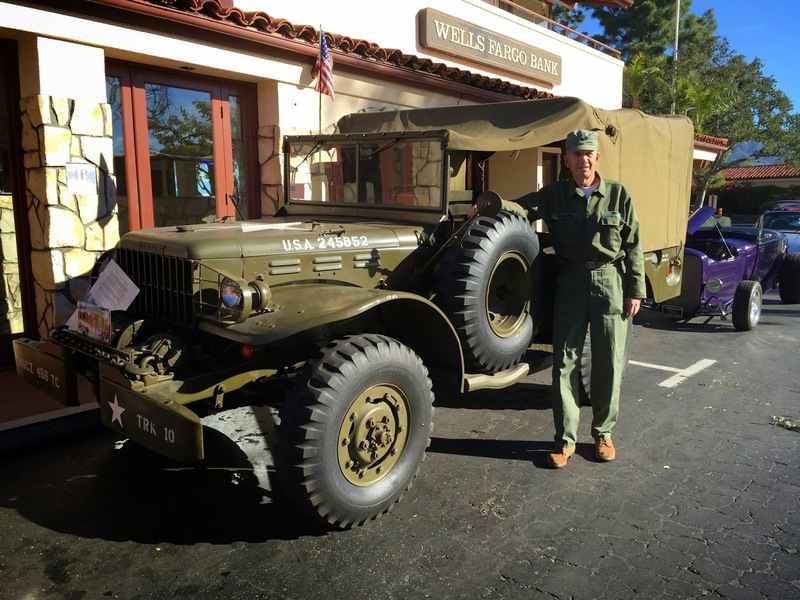 Herman Pfauter at Cars and Coffee with a 1944 Dodge WC52 weapons carrier. 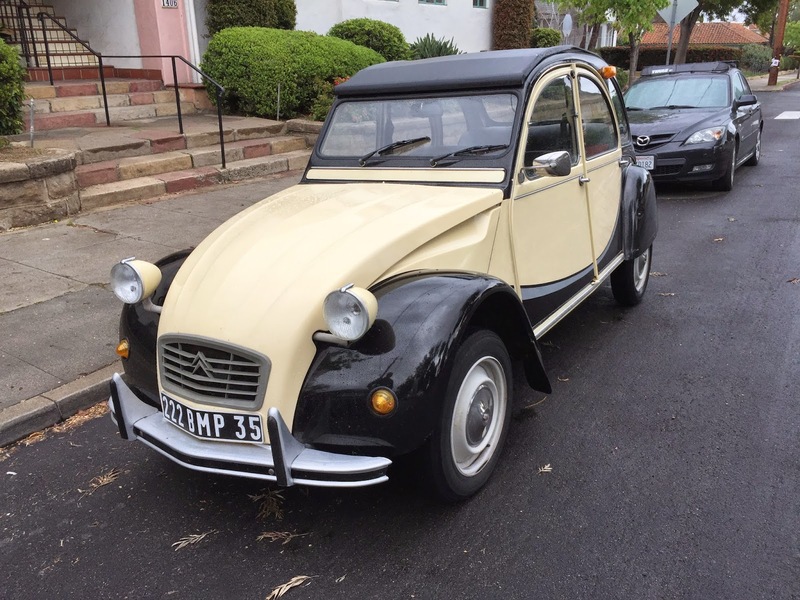 It was one of 200,000 built for the war, and he bought it from the Austrian army in 1980. Pfauter’s education and career brought him all across the U.S., from Northeastern University in Boston to UC-Berkeley and UCSB, and then all the way to Chicago to sell machine tools. He even spent a few years back in Germany, but his affinity for the American way of life ensured his return, and he settled in Goleta in 1984. By then he had started buying vintage military vehicles again, and in the years since his collection has grown to a dozen, all from the World War II era and sourced mostly from Europe. Pfauter isn’t like most other collectors in one key way: While many are happy to have one copy each of their favorite models, he doesn’t mind redundancy. Hence his four Jeeps and three GMC CCKW [cargo truck] “Jimmys” – also known as the “Deuce and a Half” because of their 2.5-ton capacity. And those Jimmys are enormous, built for a variety of jobs, including wrecking duty for other large vehi- cles. 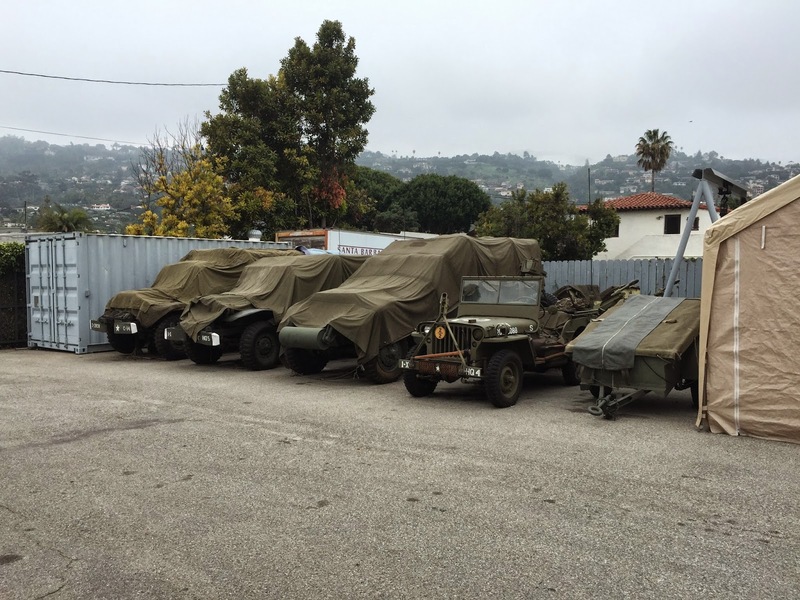 Pfauter invited me to take a look at his sprawling garage near downtown Santa Barbara, and it seems his goal of recreating the Red Ball Express Motor Pool – a convoy that would resupply the Army within enemy ter- ritory – is just about in the bag. Pfauter has even donated money to the Estrella Warbirds Museum in Paso Robles for a new building that will house most of his collection, opening later this year. The visit to his garage was a treat, with vehicles and memorabilia filling nooks and crannies around the property. Many of the vehicles are covered in military olive drab, but Pfauter keeps some civilian transport there as well. While there’s the odd AMC Gremlin lying around, his taste in civvie fare is somewhat predict- able. 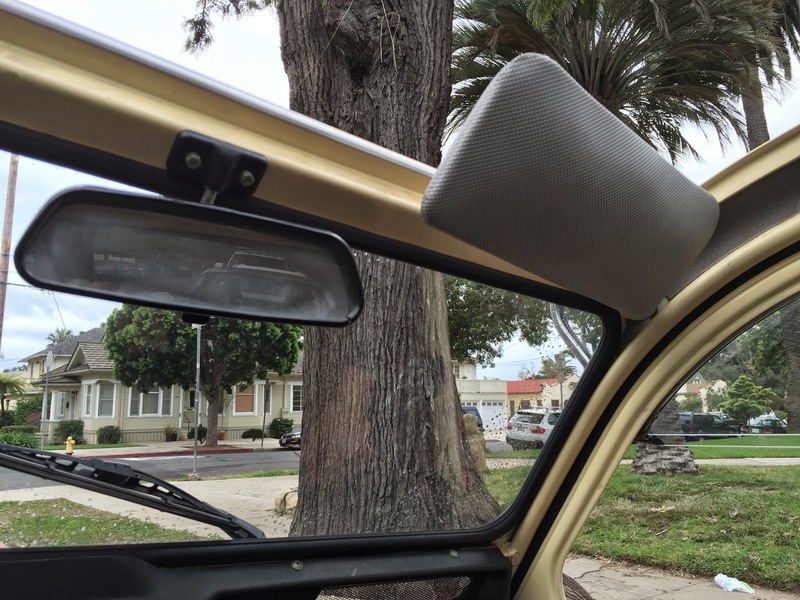 There are two Willys-Overland Jeepsters – including one he’s convert- ed to automatic for his wife – as well as a couple of 1990s Jeep Cherokees, which he considers the last acceptable Jeep to own. 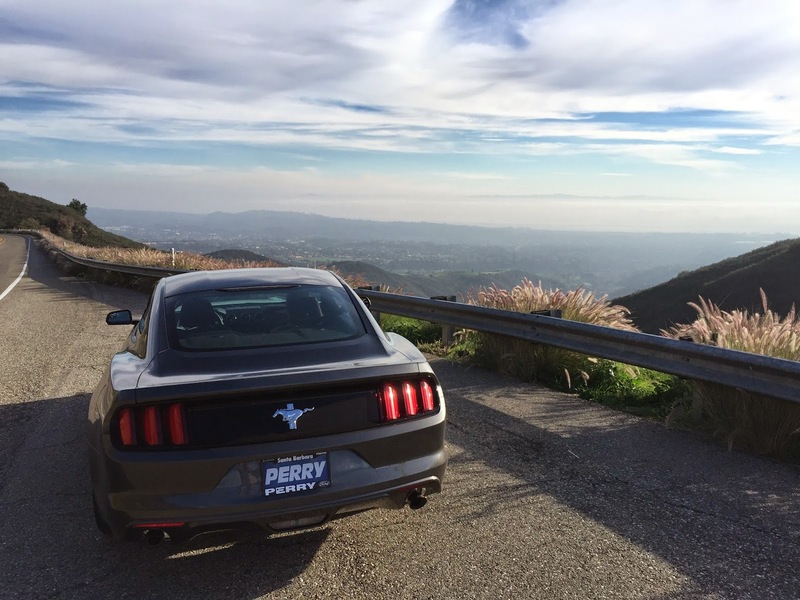 As a car guy, I naturally nudged the conversation toward his experiences with different brands. Pfauter mentioned that he’d worked on some British cars, and even owned a Land Rover – which suffered from “atro- cious workmanship”– in the 1970s. But he carries a distinct reverence for a bygone era of the Jeep brand, and automobiles in general, when it was possible to get your hands dirty, doing the major maintenance for a vehicle by yourself. He spoke with fondness of the inline-six engines that Jeep used until the 1990s, with straightforward technology that fostered bulletproof reliability – at least in its powertrains. And I related to Pfauter my experiences with the modern equivalents of these workhorses, and what the respective brands stand for. Recently, I’d had the chance to drive the flagships of both the Jeep and Land Rover brands back-to-back, and the experience revealed interesting truths about the brands’ trajectories over the decades. While the Jeeps I’ve driven are thoroughly modern, with electronic differentials and Hill Descent Control, they’re also sturdy workhorses that go about their business in a no-nonsense manner. To me, the Land Rovers have been characterized by their stateliness and a focus on the grand entrance. Driving the Jeep Grand Cherokee Summit just before a Range Rover Supercharged told me that, while I’d certainly grab the keys to the Brit if I were headed to a movie premiere in L.A., I’d much rather own the good ol’ American Jeep. And this would be irrespective of the savings of nearly 50 percent I’d realize, and the Jeep’s far-better track record of long-term dependability. 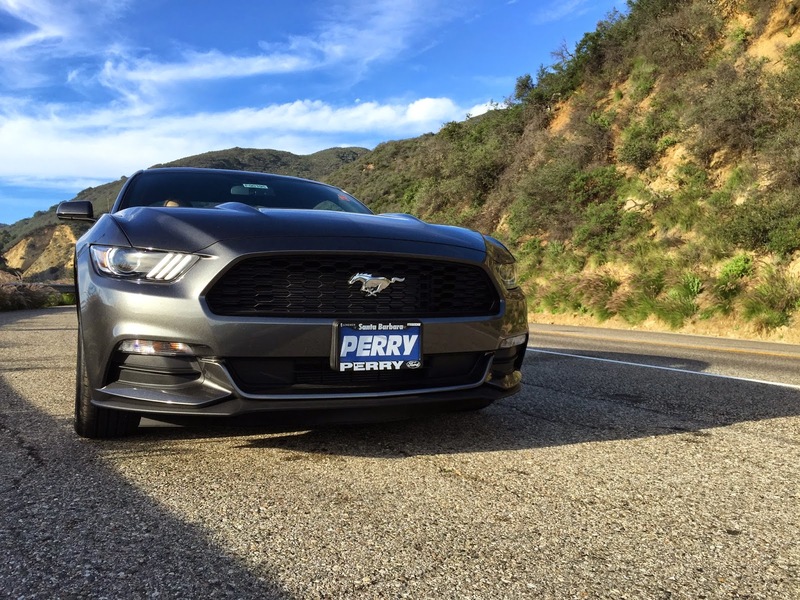 It’s just that good in so many ways, from the superior ride comfort to the feature set advantages, to the vastly better setup of the infotainment system. But Pfauter doesn’t really care much for the modern baubles. He likes his vehicles, and their styling, to be simple, so it’s no surprise that he developed a love for early military jeeps. But most of all, Pfauter just nurtures a deep-seated enthusiasm for this era of American steel, and the men and women who used it for higher purposes. He loves to talk to people and share his passion. And he’s above all a friendly soul, who laughed with genuine mirth about our significant others sharing the same first name. So when you see a WWII-era military vehicle at Cars and Coffee on Sunday, February 8, ask the man dressed in period garb about it. He’d love to talk with you.